If I had to sum up this set in one word, it would be overpriced. For a “limited edition” set (and the only release of the series in the US) it has remarkably little in terms of extras and is frankly not worth the price – even if the show is one of my favorites. 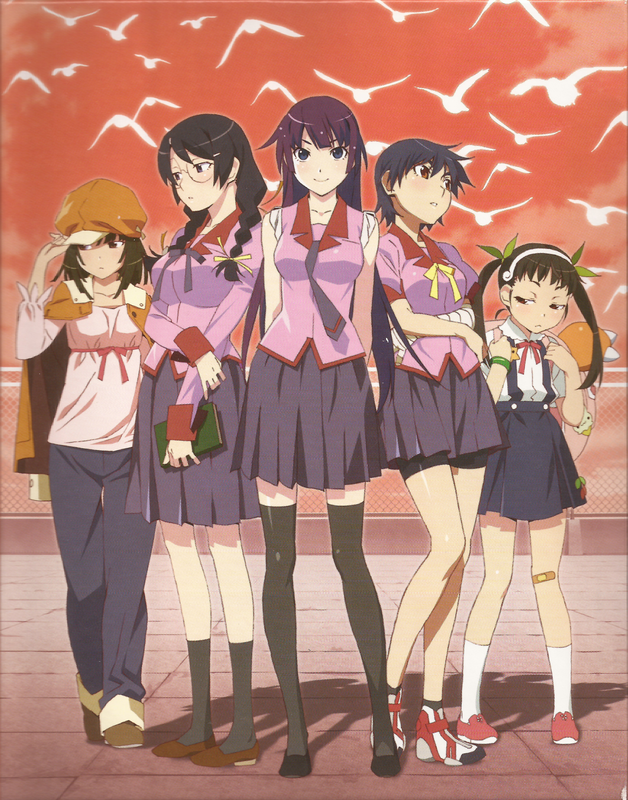 The Bakemonogatari Limited Edition Blu-ray Box Set comes with all 15 episodes on 6 discs – these six discs are contained in three cases that fit neatly into the box. Besides the episodes themselves, the discs have textless openings/endings, subtitled audio commentary, previews that had been aired on TV, and a promo video. It confuses me that the entire series of 15 episodes was released on six discs – blu-ray discs could easily fit much more than that at the same quality. In addition, having the discs in three separate cases within the bland case thing (the proper term is on the tip of my tongue!) rather than a single multi-disc case is very odd – if you’re familiar with cases such as those from Funimation’s BD releases, you probably understand the type of thing that I’m talking about. 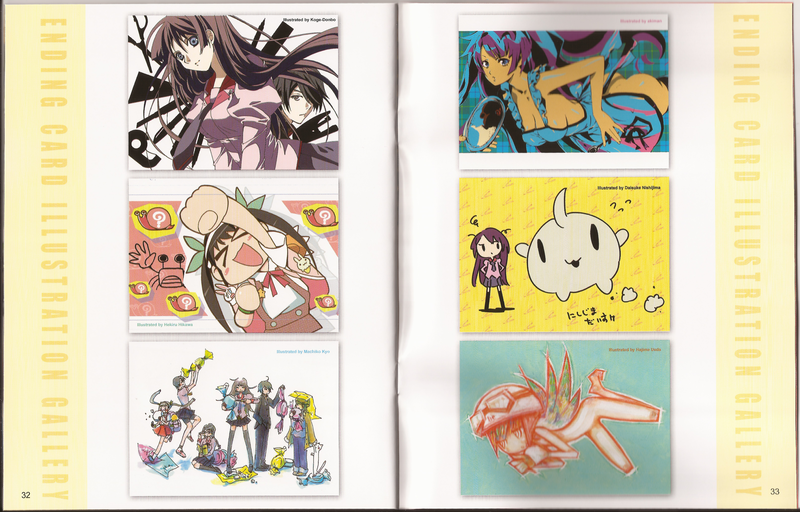 The additional artwork is nice, but it wouldn’t matter if the included booklet was actually sufficient – more on that later. Also, while they are not necessarily problems for me, many people will likely be turned away by the lack of an English dub or 5.1 surround sound mix. 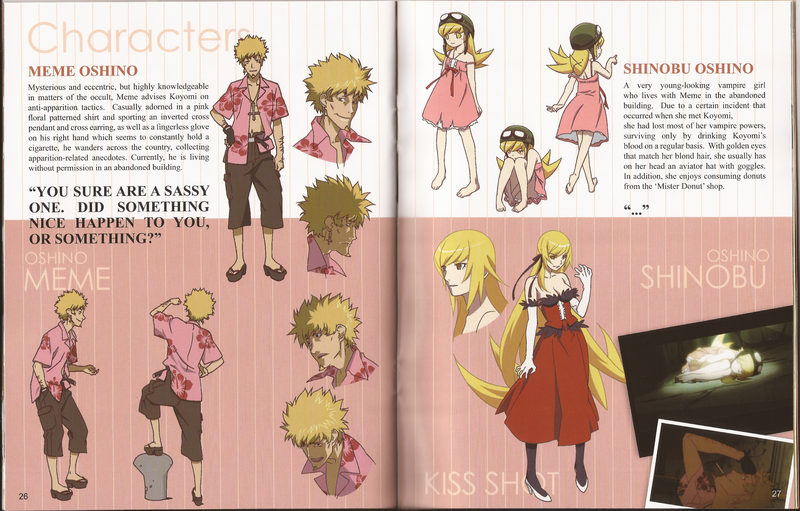 The Monogatari Series seems like one of the most difficult anime to dub because of a heavy reliance on the Japanese language – if you can at least hear what’s being said, subtitles are normally sufficient. 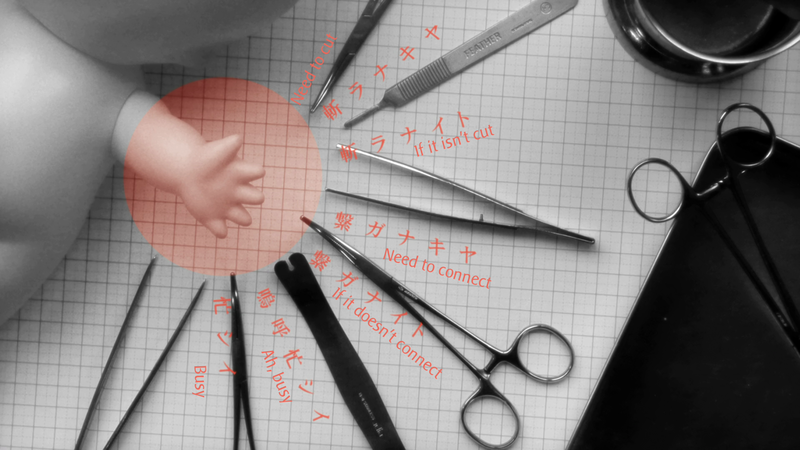 Of course, when discussions about words such as moe (萌え) and tore (蕩れ) show up, any translation, whether via dub or sub, will be insufficient for relaying the nuance of the topics. On that topic, my main issue with the actual videos is the subtitling and typesetting – typesetting refers to text besides spoken dialogue/monologue, such as sign translations and what-not. 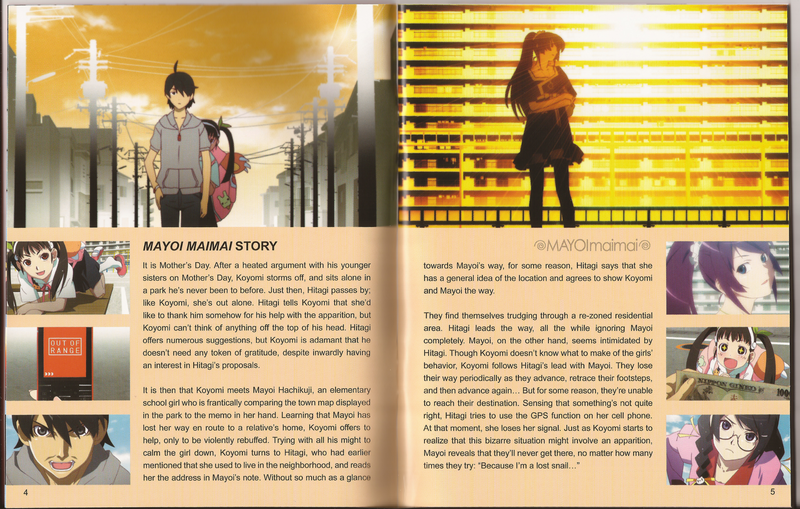 Bakemonogatari is a dialogue-heavy show, and combined with plenty of onscreen text, the end result just looks like a mess a lot of the time. 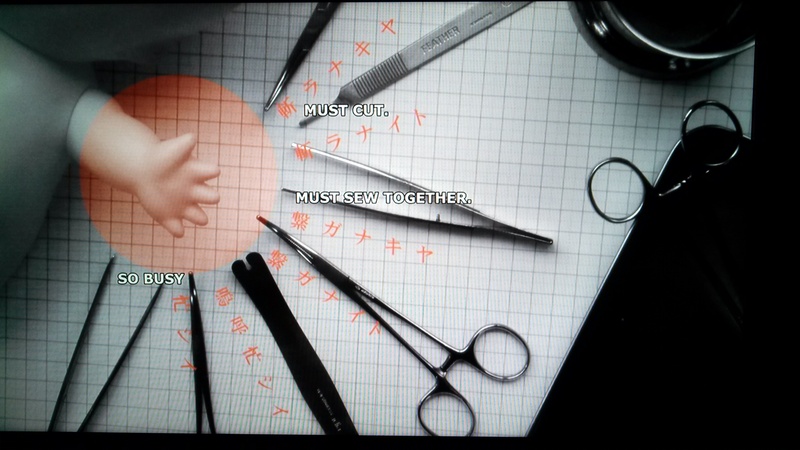 If you were to compare the subtitling on these discs to those from a popular fansub group, the fansubs would inevitably be much higher quality – more appropriate font choice, better sizing, not having all typesetting in caps, not using a yellow font at default for dialogue, etc. This is how the typesetting is done by one fansub group (Afternoon Naps Empire/GG) – the translated text was matched up very well to the Japanese text present in the original video. I honestly don’t know if the poor typesetting is the result of a limitation from how DVDs/BDs are formatted, but it is extremely ugly. All in all, the discs themselves have both the expected bonuses and a bit more, even if the main video’s presentation is certainly flawed. Unfortunately, the rest of the set (what little there is) is not up to par. Besides the discs, the only other contents of the set are a 34-page booklet that contains arc summaries, character designs and information, and a collection of the ending cards used during the airing of the show. While the character designs and info are interesting to look through, the story summaries are completely unnecessary – people buy the set to watch the story, not read a synopsis of each arc. Compared to the booklet included with the Madoka Magica movies limited edition set (or rather, comparing them in all regards), this one seems like a complete joke. The text is literally just a summary of the arc, omitting only the conclusion. Why even waste the paper? 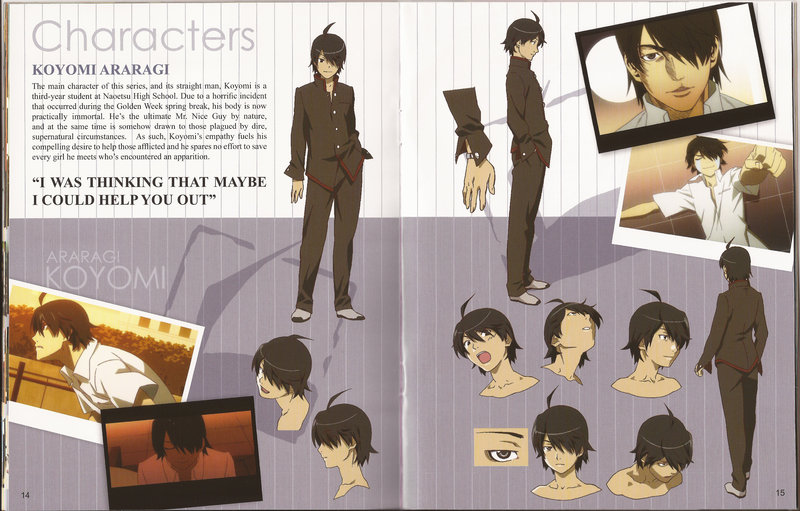 On the anime itself – Bakemonogatari is the first part of the Monogatari Series, and is followed by Nisemonogatari, Nekomonogatari, and Monogatari Series Second Season. This is one of my favorite shows, and that just leaves me even more disappointed with this set. After reading only the synopsis, my expectations for the show were completely different than how it ended up being – between an unconventional yet distinct visual style, interesting yet strange character interactions, and a plot that sounds straightforward but turns out to be much more unusual in its components, it ended up not only differing from how I assumed it would be, but being far more enjoyable than I would have otherwise thought it could. 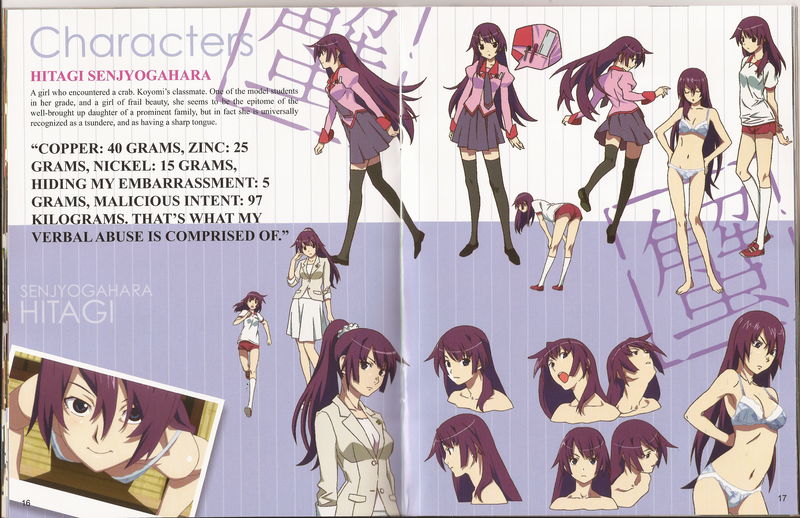 And despite everyone referring to Senjougahara as a tsundere, she isn’t. Not quite anyways, she’s more kuudere/tsundere/best girl besides Kaiki. I would definitely recommend watching this series, but try to avoid going into it with assumptions about what it might be like, as strange as that sounds. I’ve purposefully avoided being specific about the story and other elements of the show for this very reason. Overall, because of the price and lack of things to show for it, I would never recommend to buy this set new. Unless you eat, sleep, and breathe this series, it is not worth the money. There is no dub, the subtitling/typesetting is disappointing, the physical extras are completely underwhelming, and there is a general lack of anything to show for the price. I wouldn’t have even bought it if it hadn’t been right after Christmas. 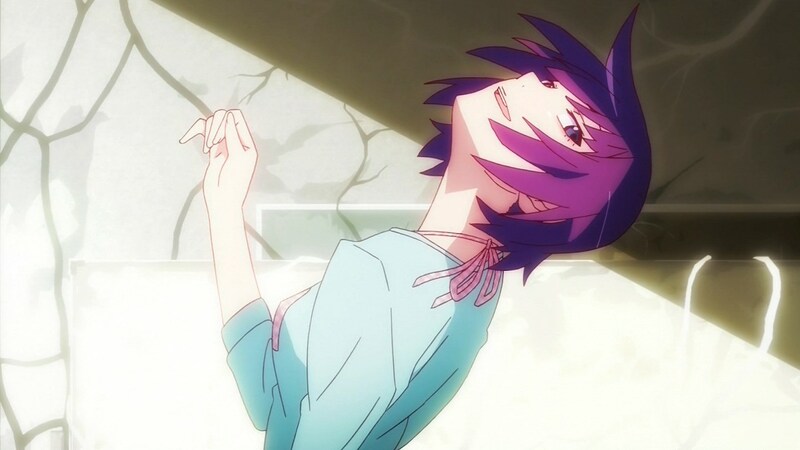 Unless I can find the Nisemonogatari (the sequel series) set for a drastically lower price, I’ll pass on it and save my money for something that’s actually worth the cost. This set should at least include the soundtrack or some other bonuses – for this price, they wouldn’t be losing out on including them, and more things included would likely result in an increase in sales. If you’re the type of person who doesn’t think twice about downloading fansubbed releases, you will have abolutely no use for this set unless you need some expensive coasters. What leaves me most baffled is how Aniplex thought this set was worth so much money – the MSRP is 190USD, and the cheapest I’ve found it was at Rightstuf.com, for 150USD. The standard Madoka Magica series (also released by Aniplex USA) normally totals about 120USD (but can be found for less), but that at least includes a dub, so a slightly inflated price is understandable. There was also a limited edition that did include the soundtrack and extras for a higher price. Calling this Bakemonogatari set “limited edition” is ridiculous, especially when it is the only release of the series in the US and comes with only negligible extras. Skip this release, but watch the show – you can find it on both Hulu and Crunchyroll. agree we need a cheaper bundle. Put whole series dvd release together. Would throw me over 600 buck when I can like 5-6 to series around 300 buck. I damn love this series. Want get good quality. I hope for new bundle. I like give creator my money. I wouldn’t expect a different bundle, but I am curious about how they’ll price the Second Season. Nisemono was a bit cheaper than this one, but for how little comes with it, I don’t even think it’s worth getting. I’d like to support them, but I don’t feel like making donations. Thanks for this review! I’ve been watching a fansub and was thinking about getting the bluray (it’s much cheaper in the UK, or after all this time). Having seen the poor typesetting though… no chance.